A birdbath adds some excitement to your backyard landscaping by attracting lots of wildlife to your yard. In addition to birds, squirrels and--if you’re in the right area--deer will come to drink out of your birdbath, as well as raccoons, possums and other creatures. Concrete birdbaths will crack in extreme weather conditions. One of the best ways to avoid getting cracks in the birdbath is to seal it. The process can be done quickly with just a couple of supplies, but your efforts will extend the life of the birdbath for years. Put on a pair of rubber gloves, and empty the water out of your birdbath by scooping it out with a cup. Spray the birdbath with a garden hose to remove as much dirt as possible. Clean the birdbath with a mix of dishwashing soap and water. Use a scrubbie sponge to clean off any bird droppings or mold. Rinse the birdbath well with the garden hose. Try to remove all traces of the soap. Dry the birdbath with a towel, and let it air dry for 24 hours. Spray the clear acrylic sealer over the entire birdbath, including the stand. Follow the manufacturer’s directions on the can for use and drying times. Refill the birdbath with water after the sealer has dried. 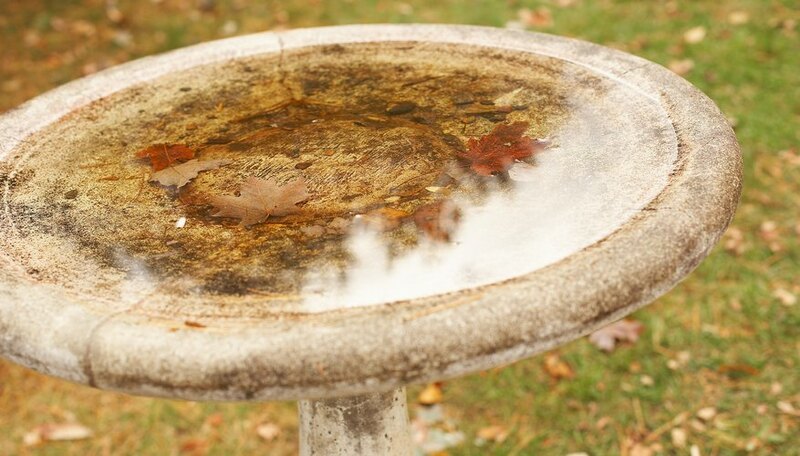 Store your birdbath inside during the coldest winter months to keep it from cracking. Wet concrete can take some time to dry. Do not attempt to seal the birdbath before it is dry.